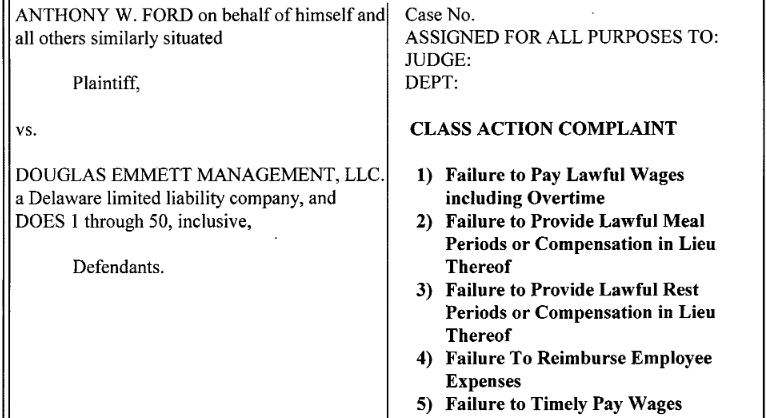 In 2014, Douglas Emmett, Inc. was forced to settle a large-scale class action lawsuit for over $400,000. Complaints filed in the Los Angeles County Superior Court allege that the company systematically underpaid its employees and threatened retaliation against those who spoke out. Despite these issues supposedly being settled, a recent complaint filed in the Los Angeles Superior Court alleges that Douglas Emmett Management, LLC is still practicing many of the same illegal policies and practices. From 2011 to 2013, Douglas Emmett was hit with a series of five related lawsuits alleging systemic wage and hour abuses, the largest of which was Lindsay vs. Douglas Emmett, Inc. These lawsuits alleged that Douglas Emmett had embarked on a policy of requiring unpaid overtime work, not allowing workers to take legally-mandated breaks, and having employees work through meal periods without compensation. Supervisors compelled employees to turn in time sheets showing eight hour days and forty-hour work weeks, despite the fact that employees were often working significantly longer. According to declarations from suit participants, workers who spoke up about these practices were often threatened with dismissal. After these lawsuits were filed, the plaintiffs further alleged that Douglas Emmett used deceptive tactics and threats of retaliation to discourage employees from joining the lawsuits. These lawsuits were settled in 2014 when Douglas Emmett agreed to pay more than $400,000 distributed among the participants in the suit. 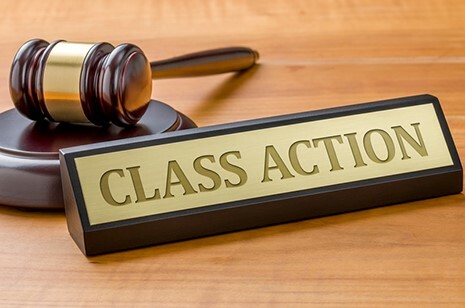 However, the pattern of illegal practices described in these lawsuits are similar to those alleged in a class action complaint filed in May 2018. According to the complaint filed in the case of Anthony W. Ford vs. Douglas Emmett Management, LLC, employees were allegedly required to work through their meal breaks without compensation and to work unpaid overtime prior to clocking in and after clocking out. These are the same violations alleged in the case of Lindsay vs. Douglas Emmett, Inc, filed seven years earlier. In addition, workers allege that they were expected to pay certain work-related expenses, such as gasoline, out of their own pocket. The complaint mentions that over 100 employees are believed to be affected by this policy of systematic underpayment.